The Bharatiya Janata Party (BJP) on Monday named actor-turned-politician Ravi Kishan from Uttar Pradesh's Gorakhpur in its list of seven candidates announced for the Lok Sabha election. 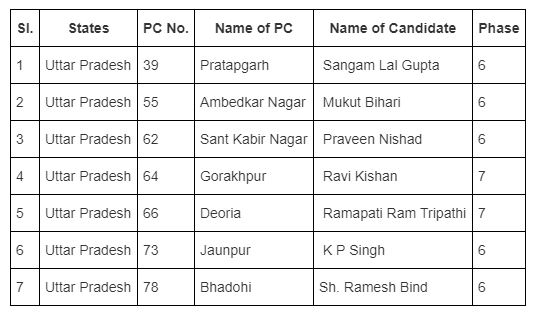 Among the other candidates named in Uttar Pradesh by the party include Praveen Nishad from Sant Kabir Nagar instead of Sharad Tripathi who is the sitting MP from Sant Kabir Nagar. All the names announced by the party are for the sixth phase of election which will be held on May 12. The names of candidates were decided in a meeting of the Central Election Committee. With this list of seven candidates, the party has so far announced candidates for 420 Lok Sabha seats.